Colourful, fun and a great way to give fresh fruit to your children. 1. Puree the strawberries with a hand blender. Sieve the puree to get rid of the seeds. 2. Stir 1 ½ tbsp of the honey into the puree. 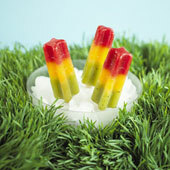 Then pour the strawberry puree into each of the ice lolly moulds until each mould is ⅓ full. 3. Freeze until firm – this should take 1 ½ hours. 4. Repeat this process with the peaches and 1 ½ tbsp of the honey, then the kiwi fruit with the rest of the honey, freezing between each fruit. You are currently browsing the Nutritional Concepts Tips and Advice Blog blog archives for July, 2010.